South Africa is a big geography and within its vastness is a region which is moderately populated and untroubled by development - Namaqualand. Unless you live there or have undertaken a self-drive journey to Namibia, it’s unlikely you’ll have visited the Namaqualand, which comprises South Africa’s largest municipality and some phenomenal destinations. When Ford suggested we trek around Namaqualand, the incentive of adventuring in one of South Africa’s least populated regions was irresistible. The idea was simple: a journey up the west coast until Western Cape becomes Northern Cape, and then route inland, toward the mountainous regions two hours from the Namibian border. For years few bothered going to Namaqualand because the landscape appears too harsh and its coastline is dominated by alluvial diamond mining concessions, making travel unappealingly troublesome. Of late, much has changed, and the road infrastructure is tremendous. Our plan was to set-off from Cape Town to Lambert’s Bay, before transitioning into the diamond mining area surrounding Kleinsee. The landscapes here are epic in scale and roads, either tar or dirt, route exactly where you wanted them to, enabling natural navigation amongst towering mountains and windswept coastlines. Enabling our journey were a fleet of Everest 3.2s, in XLT and Limited trim. 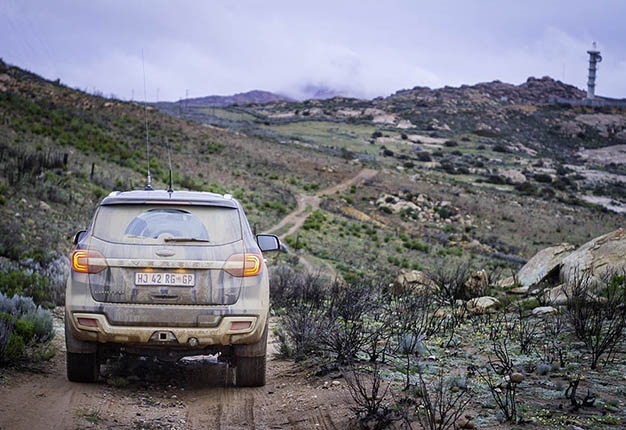 Although the two SUVs had different sized wheels and tyres (XLT rolling 265/60/18s, with Limited on 265/50/20s), they were both immensely comfortable on some of the more challenging corrugated roads deep within the Namaqua coastal region. Everest’s Watts-link rear suspension should take credit for the ride comfort and tracking stability on the Namaqualand dirt roads, even at three-figure cruising speeds. Our apex destination along the coast was Noup, a collection of former diamond divers’ cottages which have been repurposed as tourism accommodation. Their location, on a small bluff overlooking a bay, is incomparable and the sense of isolation will purge any urbanised visitor of their city-dwelling angst. From Noup we set coordinates for Leliesfontein, deep within the Kamiesberg. It’s a journey of less than 200km but don’t let the apparently short distance fool you. The Namaqualand coast might be one of the driest places on earth, but it does occasionally receive heavy rainfall and we woke to the sound of droplets pattering against the windows of our diving cottages. Anyone who has ever resided in a desert region will tell you that parched dirt roads turn to potentially lethal clay surfaced ice rink after even the humblest downpour. We were about to discover just how slippery and challenging Namaqualand gravel travel can become as we marshalled our Everests out of Noup. 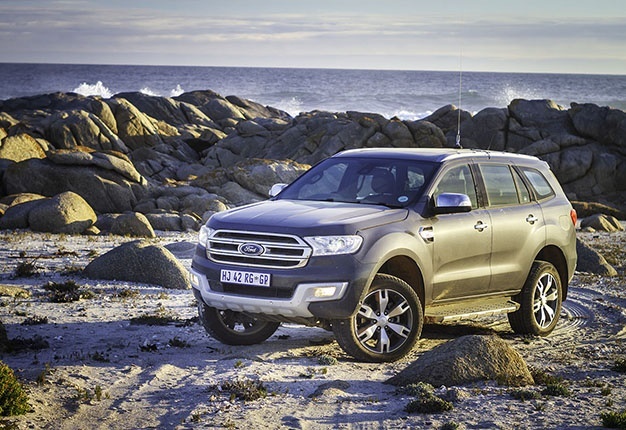 Ford’s most popular South African SUV is permanent all-wheel drive, so we knew there was a margin of traction perpetually guarding against us sliding catastrophically sideways over a bump or sheet of corrugations. To harvest the Everest's full potential in challenging conditions, it was a simple turning of the terrain management selector dial to its ‘Gras/Gravel/Snow’ setting and trusting the traction control and ABS algorithms to safeguard stability, whilst we merely attended to steering and throttle inputs. After an hour and a half of hearing mud being flung into the wheel wells, we finally rolled back onto tar and discovered a road that was perhaps better suited to a Focus ST or Mustang. Narrow and winding, the Spektakel pass connects Komaggas to Springbok, and it is one of the best driver’s roads you’ll ever encounter. There is a spectacular viewpoint a few hundred meters before you crest its peak and we stopped there to admire the openness of the valley we had just ascended from. The traditional ladder-frame chassis SUV with low-range is often cited as being overkill for most South Africans, yet vehicles such as Everest remain boundlessly popular. As we routed southeast of Springbok, into the Kamiesberg, our Everest's would prove why having all that latent off-road ability in reserve, is crucial. If rain is a rarity in the Namaqualand, snow is even more so. And as we navigated deep into the towering Kamiesberg, the weather turned from unpleasant to nasty – in the extreme. Driving rain converted challenging dirt road mountain passes to washed-out off-road obstacles, with deep river crossings as we connected a succession of valleys. Temperatures hovered around zero and it was the very last place you want to attempt a vehicle recovery if somebody got stuck. Constant throttle, with the heater setting on maximum, kept us snug in the Everest cabin whilst it effortlessly rolled through every rut and forded each river. The Limited-edition Everest did slide around a touch more, due to its larger wheels and more highway biased tyres, but the intervention systems were so good that what could have been a nightmarish encounter with Namaqualand snowfall, was never anything less than a uniquely South African gravel travel adventure. Traversing a semi-desert plateau in snowfall, was one of those distinctively South African experiences. The Northern Cape is a wondrous place with magnificent roads, which makes exploring it immensely convenient, despite the huge distances involved. 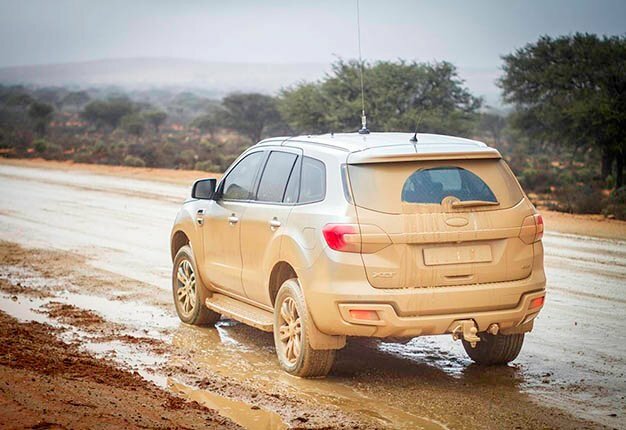 And if you have a ladder-frame SUV with true off-road ability, such as Ford’s Everest, you owe yourself and the vehicle, an opportunity to experience some of the best journeying South Africa has to offer.